Before you search for a roll off rental company, you should consider the regulations imposed by the Orange County area government. Residential and commercial projects will create a lot of trash and debris. Some people might only realize it later on when they see that heap of garbage and junk getting higher and higher. Construction and demolition projects produce a lot of debris, junk and rubble. However, there are many considerations before we can send over a roll-off container to your area. Because of the cramped space, you may be limited as to the size of the dumpster you can rent. If you ever have questions about our dumpsters for rent, we are available to answer them through the phone. 10 cubic yard dumpster holds approximately 4 pick-up trucks of debris. They’re often used on projects like small bathroom or kitchen remodels, garage or basement cleanouts, small roof replacements up to 1500 sq ft or a small deck removal up to 500 sq ft. It can be quite challenging to determine the correct size of dumpster you should rent out for a Dana Point residential project. These are reserved for commercial worksites where the junk and debris they produce are much greater. Bigger types of dumpsters such as 20 or 30-yard trucks are perfect for major complete home renovations. For community projects, you should use the largest type of truck. Sometimes, during in-demand seasons, it is harder to find large types of containers. As already mentioned, the price will go up when it’s the season for renting. This usually refers to the summer or when the weather is clear. 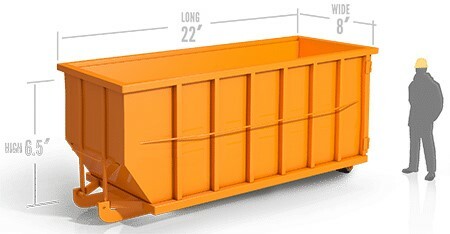 To contact Jux2 Dumpster Rental, dial 949-247-8323. We will immediately assist you with your rental dumpster inquiries. It can be frustrating to pay for unnecessary fees because you booked an oversized bin. At the same time, it can also be difficult to get rid of your trash if the dumpster is too small. Don’t end up paying for an oversized type of trash bins just because you failed to determine how much trash your project will generate. In order to maximize the value of your money, accuracy is very important. Again, there are factors to consider when renting a dumpster in Dana Point. You have zoning laws, as well as fees for throwing trash onto the sanitary landfill. We need to solicit some information that will be material to the final cost. We will also consider your location in relation to the where the landfill is located. The farther they are apart, the more you will pay for gas. With that said, let us disabuse the myth that dumpsters for rent are expensive. Call the staff of Jux2 Dumpster Rental at 949-247-8323 to get the approximate price of the roll off rental, which will be provided once we get all the pertinent information. We will immediately provide a cost estimate for the container you need. For one, you can’t fill it up to the brim because we will be forced to lop off from the top to avoid violating the law. Why Do You Need to Secure A Permit Before Renting a Trash Container In Dana Point? Dana Point implements strict waste transportation laws. You can’t just install a trash bin in an area unless it is approved by the authority. The cost of the clearance processing will be added to the total cost of the service. Even if the government might not mind you putting the metal dumpster in your property, your homeowner’s association might have another say on the matter. If the dumpster will be installed in a private space, you may not be required to ask for the approval of the government. However, to avoid issues, it is better to consult with a local official before you book a dumpster for rent. We can guide you through the process if you just call our number at 949-247-8323. Our team is here to help you. We may even give you a rough estimate of how much you would pay. Upon your request, we can provide the contact details of the Dana Point office’s point person. For clarifications or questions, contact Jux2 Dumpster Rental at 949-247-8323. If you think that the process of booking a roll off rental service is too overwhelming, let our team assist you. Leaving them lying around will make your worksite very dangerous. Also, we may have to drag the dumpster on the appointed schedule whether you are finished filling it or not. Our team will provide the accurate and up-to-date information about zoning laws, landfill fees and special roll off dumpster permit requirement in Dana Point. If you have questions, you can get in touch with us through calling 949-247-8323.